On September 24th, I raced the Trail Aiguilles Rouges (TAR). A 50km, near to 4000m ascent mountain race around the panoramic Aiguilles Rouges nature reserve surrounding Chamonix. This event has been on my mind and in my sights since last year, when I made the decision not to compete due to a foot injury. This year, it was time to take it on. The 4:30am start turned out to be warm. This was a relief. 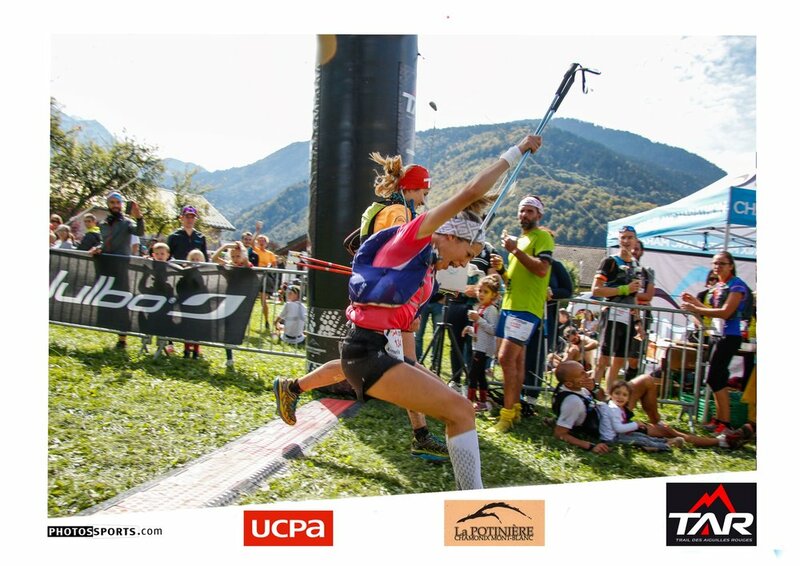 Only the week before there had been snowfall at 2000m, so stripping down to my arm warmers, Salomon Agile SS T-shirt, Salomon Trail Runner shorts and Salomon Exo compression calves, I felt comfortable on the starting line. Intuitively, and like many races before, I chose to wear Speedcross 4’s for keeping grippy and stable on the technical profile. Thanks for the early pic Meg! Starting at that time of day was surprisingly chilled out and peaceful. After the final countdown, we paced it through the main street of Chamonix and I felt really calm, with a bit of thrill for what was happening. I had decided to resist pelting it at the beginning, and as we passed through those initial kilometres, I felt comfortable with this strategy. The first climb to Flégère was steady. The perception of an environment I had trained in many times totally changed for me in the limited light, but there was something quite magical about the firefly-like atmosphere of everyone’s torches. From the very beginning, I was conscious of nutrition, and found myself snacking early into that first climb. Nikki Barnard (one of the best people on and off the trail) had recommended Snickers, so I began chowing down on a bar within moments into the first climb. Due to settled snow at Lac Blanc, the course changed at Flégère to then make a speedy traverse to Tete aux vent, before the rocky descent to Col des Montets. With a male runner leading the small group I found myself in, I gained a good rhythm as I followed the moving light ahead of mine, taking in the boulders and changes to the path as they came. It was early in the morning, and early in the race. I had memories of passing other female runners at the beginning, but in the darkness there was very little to indicate where my overall position was. I found myself surprisingly unconcerned with it. Wherever I was, there was a long way to go. Hearing from a steward “troisieme femme” in the darkness, therefore completely surprised me. However, rather than manically sprinting in some kind of hunger for glory, I decided to try and ignore it. I wasn’t even ten miles in - anything could happen. My friend and great runner Meg had reminded me of the Mantra “ In the first half don’t be an idiot; in the second half don’t be a wimp’, and there was opportunity here to really muck it up. So I told myself he probably said ‘thirteenth’, got my head down, and cracked steadily on. The race runs through the picturesque valley floor (fairly indistinguishable at this time of day) towards Buet at about the 15km point, before swinging left and towards the meaty middle section of this race: the ascent to Col de Salenton. The sun was coming up, and with further confirmation of my third position (and more food) I soon re-gained my uphill rhythm for the hefty ascent. I was in a good headspace and this seemed paramount (despite the slight physical issue of a small pain growing in my pelvis). Soon enough, I was able to move past a female runner who had originally overtaken me on the descent to Col des Montets. I have always enjoyed the methodical nature of going uphill, and felt at peace in the quiet of the morning with the amazing autumn colours. This part of the course was new territory for me; the further the race went up, the more scramble and boulder-like it became, and I was enjoying the challenge. Before long we were at the fairly snowy col, and I was told I was now in second. I started to contemplate the race dynamics a bit more; if this was about half way, then how was this going to play out at the end? The route to Refuge Moëde Anterne was incredibly scenic, yet I was getting aware that the tiredness was beginning to kick in. By the time I had squelched my way through the muddy latter part of this section, I was chuffed to discover hot soup at the checkpoint which I subsequently, necked. Then it all got quite interesting. Another female runner, Manon Bohard, rocked up at the checkpoint I was shortly to leave from. This was news; given the fact I hadn’t been aware of her to this point meant she had kept a consistently excellent pace to also overtake the third lady, and was clearly looking strong. There was a long way still to go and with this in mind, I wasn’t going to hang around here long. Given the course changes, the route maintained it’s original profile with a trip up to Col du Brévent, before an added descent to Planpraz which then takes you back up to Brévent on the adjacent side (Brévent it's been a pleasure this summer, but I've seen enough of you for now). The exact feelings are hard to describe during this part, but with the third and fourth lady now visible further down below my climbs, I tried not to lose momentum. I knew I could gain advantage on the ascents, but Manon, in third position, was closing the gap between us on the descents. Thinking ahead, I knew that given the 1500m final descent from Aiguillette des Houches, my main chance to create space was to move swiftly from Brévent on the traverse while I was still in the lead. By this point my feet were sore, and the pain in my pelvis nagged a bit. My position was maintained, but it seemed a matter of time before our paths would cross. Which they did. The final descent of this particular race route is a force to be reckoned with; after near to 4000m total ascent, you need to keep your composure for the 1500m straight down from the ridge at Aiguillette des Houches. Scrunching my toes in order to avoid the incredibly sharp pain of literally any impact was the only way to proceed. With only a handful of kilometres to go, I turned to see Manon well on her way. She caught me up. What was to follow was something I still can’t quite understand. Manon suggested we finish together. I couldn’t believe it. Although during the majority of this race I had taken the lead, the profile of the course had played to her final advantage and it was hers for the taking. She didn’t take it. We ran through the streets of Servoz together, and I took her hand for the finishing line. Writing this has helped to re-live one of the most memorable days yet. If you want to see human nature at it’s best - test it in an endurance event. The way people come together, the support from those you love, the gallantry of competitors, is all pretty magical. Due to a time penalty incurred by the winning woman (and a huge amount of respect goes to her sustained physical power during the race), Manon and I ended up as joint winners of the TAR 2017. It’s done. So happy, and a spectacular end to an awesome summer of trail running. What next? I’ve got some ideas for 2018 and cannot wait to live out more adventures on mountain trails. Let’s see… #timetoplay.